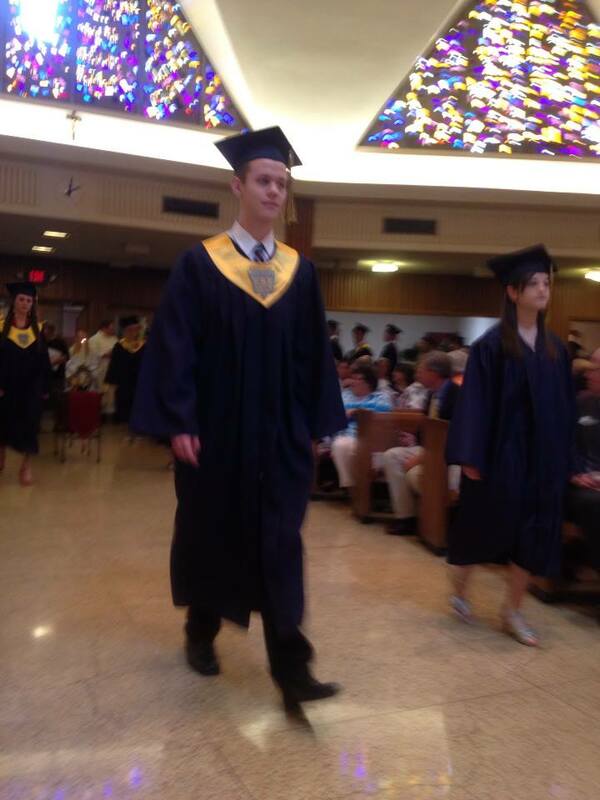 My son graduated from high school today. It was 19 years ago that I found out I was pregnant. I have such great memories…the visit to the doctor confirming pregnancy, telling family, following the babies growth and experiencing every aspect of the pregnancy. At 19 weeks the ultra sound showed that there were problems “severe hydronephrosis” surrounding the right and left kidneys. The problems continued to grow and the case became very complex. Dr. Linda Millard referred me to the University Hospital in Columbia, Mo. We went for ultra-sounds every 2 weeks and each week the news was worse. I was so scared. I remember at Christmas, 2 months before Alex was due, crying on our couch, in front of our Christmas tree with Jim about the latest news from our doctor. Dr. Hess connected us with Dr. Lynn Teague, pediatric urologist at the University of MO. Dr. Teague was so gracious and interested in our case. He began receiving every ultra-sound tape and followed the case intensely. We saw him soon after birth. He performed several surgeries on Alex. At the time, one of the procedures was only performed there a few times each year – it was rare. We were so frightened. Did everything he said. He had a large family of his own and I remember once speaking with him on the phone at home and hearing his dog barking in the background intermingled with the sound of kids. I knew I was dealing with a doctor who was pro-life/family oriented. It gave me great relief knowing this. Alex’s condition caused him to need a “Vesicostomy” at 7 weeks. At the time this was unusual. Alex’s reflux was a 5 on the right and a 4 on the left…5 was the worse. The reflux was causing serious damage to his kidneys. At 38 weeks, labor was induced so the team of doctors could get to him sooner. His right kidney was now the size of his stomach. Alex could not be submerged in water for the first 2 years of life – no swimming, no baths. If the hole was too large the bladder could fall out. So the surgery was performed twice to insure the hole was the right size. Obviously he required special care and there were many hospitalizations. 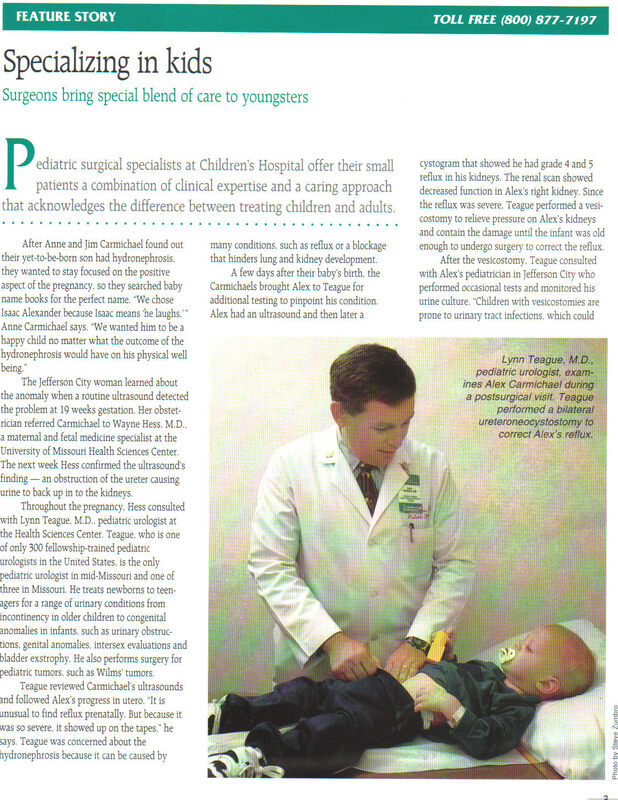 Below is an article about Dr. Teague’s treatment for Alex that ran in the MU newsletter during that time. At 18 weeks old, Alex’s ureter’s were severed and then reattached at a different spot on the bladder to force them to function properly. The vesicostomy was closed too. The procedure was 4 hours long. Jim and I were beside ourselves as we waited. When my sister, BK (Alex’s Godmother) arrived I jumped up and hugged her tight. Alex had a few bumps in the road but progressed well after the surgery. Had Alex’s very severe reflux not been caught, he would have experienced kidney failure before puberty. 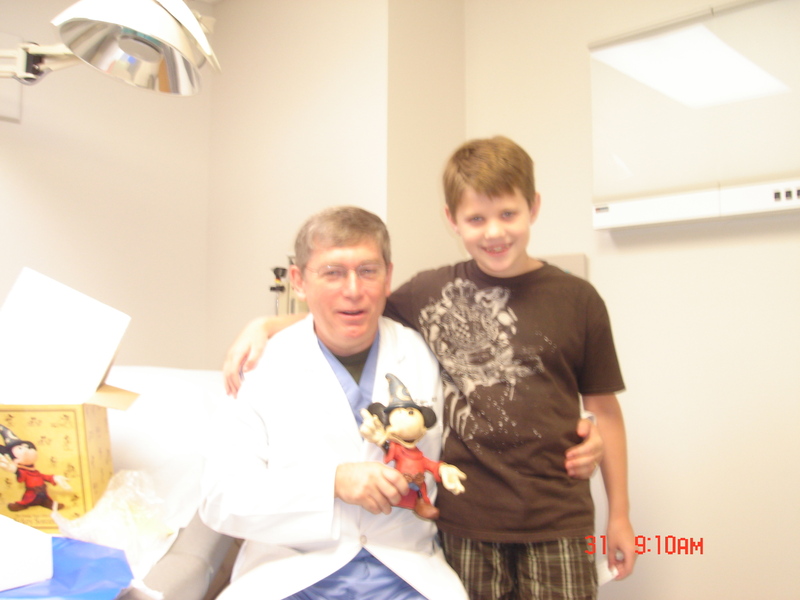 Alex with Dr. Teague at his last visit, before he moved to South Carolina. His kidney function is not normal but it is stabilized at around 50%. He made it through the most risky period (puberty) when it was feared he would out-grow his function, requiring intervention with dialysis or other and sooner than later. This was not the case. 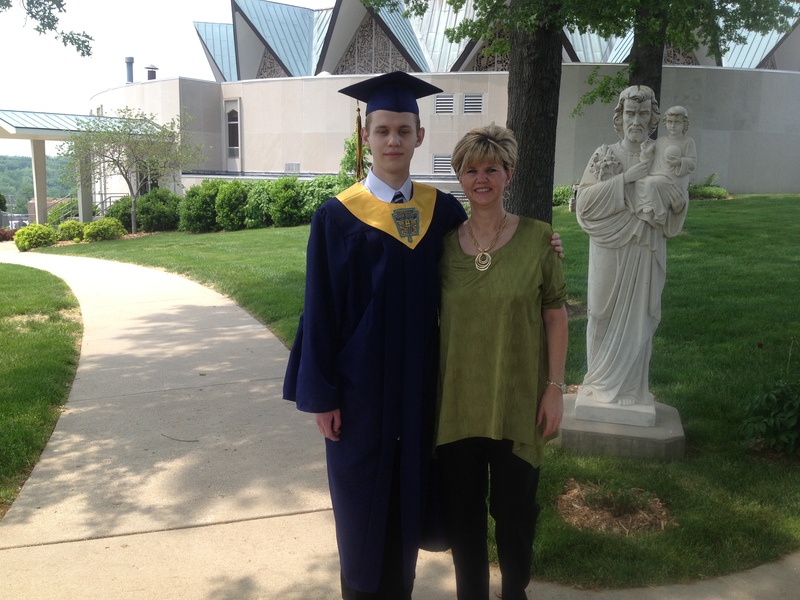 Alex graduated from high school today. 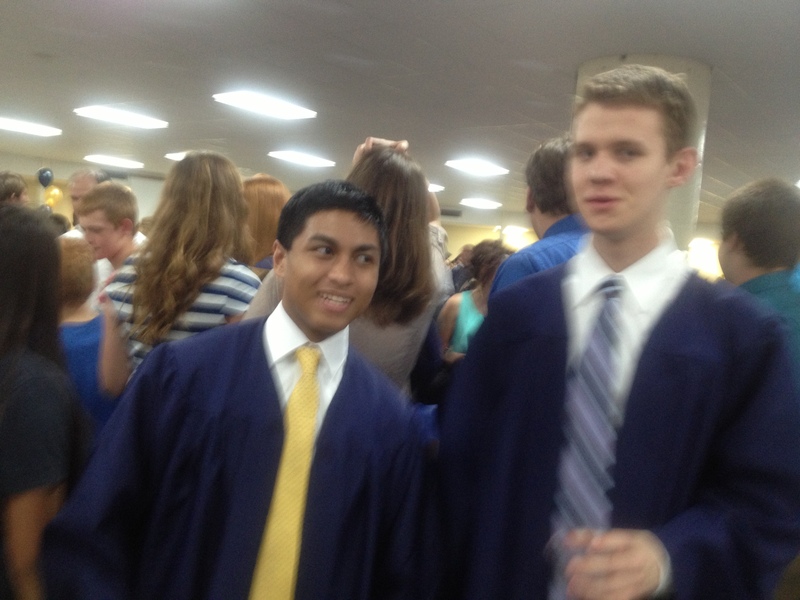 Alex (on the right) after graduation with his friend Earl. He is in the top third of his class and will be starting at a very competitive university this fall. Dr. Linda Millard ordered the ultra sound, Dr. Hess took on the case and followed it in-utero and Dr. Lynn Teague fearlessly did things that were not considered the norm to make the difference in Alex’s life. 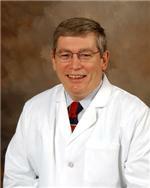 Thanks Dr. Lynn Teague who now resides in Greenville, SC. He’s the best and we are eternally grateful to him. This week I’ve had to come to terms with the fact that Alex is grown and will be leaving home soon – taking care of himself. It’s been hard to let go – really struggled with it. Thanks to Dr. Teague though, I have a son to let go of and release into the world where I know he will change it for the better. It was divine providence that brought Dr. Teague into our lives and we’ll never forget him. This entry was posted in tribute. Tagged Christmas, health, Kidney, Linda Millard, Lynn Teague, Mount Sinai Medical Center, Nephrologist, pediatric urologogist, Renal failure, Ultrasound, University of Missouri, Vesicostomy. Alex also had pretty special parents to help him get to this day! Although your post is a few years old I hope this message reaches you. I stumbled upon your post when researching “vesicostomy”. I found out my son had a dilated bladder and kidneys when I was 16 weeks pregnant and it was one of the scariest moments of my life. They began talking about abortion and trisomy.. we opted to do the amniocentesis though we had no risk factors. A lot like your story it came back normal right around christmas! I was so thankful everything was normal but still left so confused. At 36 weeks a began to have uncontrollable contractions and my little man was born. They were prepared to take him to the nicu but he appeared to be perfect and got to stay with mommy and daddy for the first 24 hours until they did some testing and discovered it was worse than they thought. Just short of 48 hours he had his first 2 procedure in which they cleared two blockages the first procedure and then inserted nephrostomy tubes the second. He spent the next 13 days in the nicu. Before being discharged he had the tubes removed and a vesicostomy placed. He is now almost 3 weeks old and we are doing great. I know your struggles and the fear of not knowing what tomorrow brings. We were informed yesterday he only has about 27% kidney function so we can only hope the blood work continues to get better and it’s not as bad as they are thinking. Reading your post has given me so much hope and to know someone has been though nearly the same thing. I couldn’t help but to bawl my eyes out as I read your amazing story. It brings me so much joy knowing your son has done so amazing and has such an inspirational story to share. Thank you so much for sharing! Your family will continue to be in my thoughts and prayers! Breanna, God bless your family and we are praying for your son. I posted your reply on my Facebook page asking for prayers. Please stay in touch with me. Dr Teague is still practicing also. Amy had this condition and had surgery at age of 1 year. Very scary. Love you guys!